Countering the withdrawal of support to the United Progressive Alliance government by the Trinamool Congress on Thursday, the Congress on Saturday followed the suit by pulling out its six ministers from the Mamata Banerjee ministry and also withdrawing support. The ministers who submitted their resignation letters to the chief minister at the Writers' Buildings were Manas Bhuinya (Irrigation, SMEs, Micro Industries, Textiles) and Abu Hena (Fisheries), both of them of cabinet rank. Ministers of state Sunil Tirkey (Consumer affairs), Abu Naser Khan Chaudhury (Science and Technology and Parliamentary Affairs), Sabina Yasmin (Labour, ESI) and Pramathanath Roy (Planning and Development) were the others. Bhuinya said that they submitted their resignation letters since the Trinamool Congress pulled out its six ministers from the UPA government and withdrew support. ministers of state along with four others on Thursday, were present when six Congress ministers put in their resignation papers before the chief minister. Party leaders, including West Bengal Pradesh Congress Committee chief Bhattacharya and Congress Legislature Party leader Md Sohrab, later met Governor M K Narayanan at Raj Bhavan and handed over Congress' letter of withdrawal of support to the Trinamool Congress government. To a question, WBPCC president Pradip Bhattacharya told reporters outside Raj Bhavan that the high command asked the party to discuss the issue of leader of opposition status for the CLP. "We will call a CLP meeting and take a decision before moving the Assembly speaker," he added. The party emerged as the single second largest party in the Assembly. The status of leader of opposition is now held by the Communist Party of India-Marxist-led Left Front. The Congress has a strength of 42 in the 294-member House, while the CPI-M has 38 and the combined strength of CPI-M-led Left Front is 60. 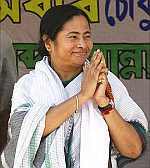 The Trinamool Congress alone has 185 members. To a question, Bhattacharya said that the WBPCC had called a meeting on October 12 to discuss its strategy.